In a very moving khutbah, Shaykh Yasir Fahmy talks about the great companion of the Prophet (saws) Bilal ibn Rabah and talks about the significance of removing racism from our communities. from New Jersey, where he was born and raised. For the past two years, he served as Scholar-in-Residence at Islamic Center of Passaic County in New Jersey. Shaykh Yasir began the study of Arabic and Islamic Sciences in his high school years under the guidance of local teachers. At the age of seventeen, he traveled to Amman, where he spent a year studying at the Islamic University of Jordan. He returned to the US and completed a Bachelor’s of Science from Rutgers University. After working in corporate America for three years in finance, he returned to the Middle East and enrolled in the prestigious Al-Azhar University in Cairo. After seven years of intensive study, Shaykh Yasir received a degree in Islamic Studies from Al-Azhar and attained numerous ‘ijazas (independent certifications) in the subjects of fiqh, hadith, aqida, usul al-fiqh, sirah, tazkiyyah, mantiq, Arabic grammar (nahu), morphology (sarf) and rhetoric (balagha). 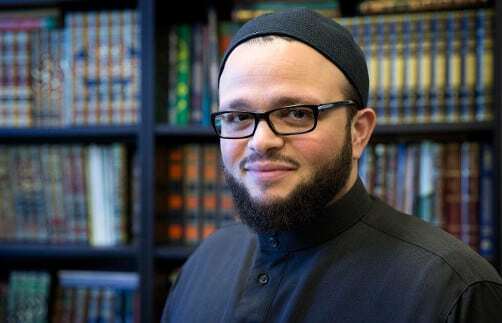 In 2013, Shaykh Yasir Fahmy became the first American Azhari to teach in the renowned Al-Azhar Mosque. Through his teaching, lecturing, mentorship, and religious leadership, Shaykh Yasir aims to foster love for the deen and appreciation of the vast richness of Islamic tradition in new generations of American Muslims.